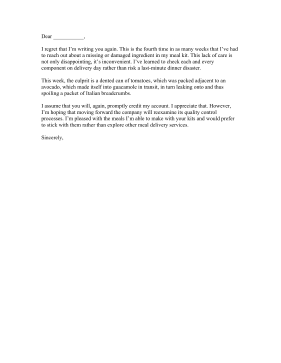 Repeated mistakes and damaged food in a meal delivery kit can warrant this complaint letter example. I regret that I'm writing you again. This is the fourth time in as many weeks that I've had to reach out about a missing or damaged ingredient in my meal kit. This lack of care is not only disappointing, it's inconvenient. I've learned to check each and every component on delivery day rather than risk a last-minute dinner disaster. This week, the culprit is a dented can of tomatoes, which was packed adjacent to an avocado, which made itself into guacamole in transit, in turn leaking onto and thus spoiling a packet of Italian breadcrumbs. I assume that you will, again, promptly credit my account. I appreciate that. However, I'm hoping that moving forward the company will reexamine its quality control processes. I'm pleased with the meals I'm able to make with your kits and would prefer to stick with them rather than explore other meal delivery services.